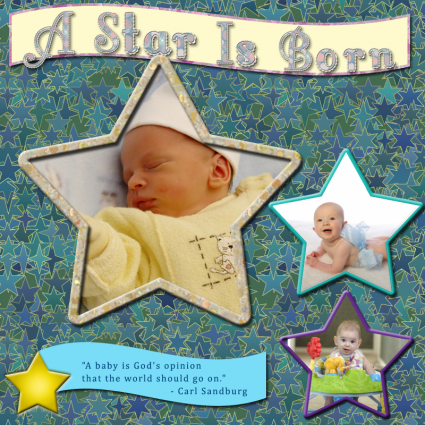 If you're making an album for your baby, adding the right saying to your scrapbook layouts can help complete the page. Whether sentimental and sweet or slightly humorous, these sayings can be the perfect addition to your project. Use them by themselves to accompany a special photo or as a way to jumpstart your scrapbook journaling. 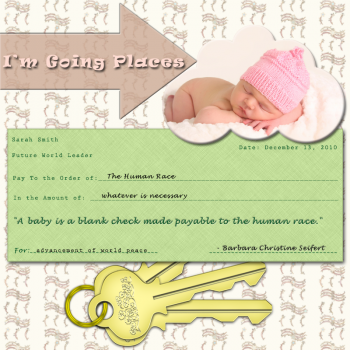 You can find more ideas for baby scrapbook page titles by visiting the Scrapbook.com title library. This helpful resource includes suggestions for general baby titles, baby boy titles, baby girl titles, and titles for pages about adopting a baby. "Always kiss your children goodnight - even if they're already asleep." - H. Jackson Brown, Jr.
To help keep track of sayings you might want to include in your baby's scrapbook, keep a small notebook in your purse. Jot down ideas when inspiration strikes, even if you don't have a specific layout in mind. Having a personal library of sayings to choose from will make it easier to make scrapbook layouts the next time you're suffering from a case of writer's block. Start your page title with a large drop cap letter for a dramatic effect. Replace words in your saying with images. Use a heart punched from pretty patterned paper to substitute for the word "love" or use a paper piecing for the word "diaper." Highlight key words in your quote or saying by going over them with a thin wash of scrapbook chalk. Repeat a short saying multiple times on a solid background to make your own patterned paper. 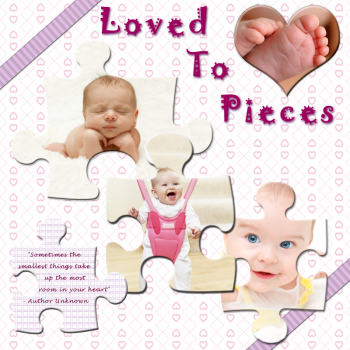 Search for free fonts with baby themes to add creative typographical treatments to your quotes. Add your favorite quote to a piece of vellum, then layer it over a photo for a soft and dreamy effect. Use rub-on letters to add a saying to the empty background space in a large photo of your newborn. Stamp the quote onto a strip of ribbon using your favorite alphabet stamps. Add a quote to a tag embellished with themed stickers and die cuts. Use a saying as your page title by combining sticker letters, alphabet brads and chipboard to create a fun mixed media effect. Fit several photos on one scrapbook layout, using a quote as the basis for the cover of an interactive mini book that attaches to your page. The right title and wording on a page can really bring it together. Give some thought to each page and finish with the right saying to make your scrapbook memorable.